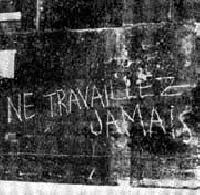 In 1953 Debord painted on a wall on the Rue de Seine the slogan “Ne travaillez jamais,” “Never Work.” He considered this bit of graffiti of tremendous importance throughout his life, including it in his autobiography, Panégyrique. The three words contain an entire program, and he was jealous of the graffiti’s use and abuse. The following letter is in response to a postcard issued containing it. The Bernard printers have sent me your letter of June 21, 1963, by which you a demand 330 F indemnity for non-observation of the law on artistic property. In fact, issue 8 of our revue contains, on page 42, the photograph of an inscription on a wall, “NEVER WORK,” a photograph drawn from a postcard by Monsieur Buffier, whose name is not mentioned and whose prior authorization was not requested. It is the case that I am personally the author of that inscription on the Rue de Seine, whose origin, if necessary, could be established by ten or fifteen eyewitnesses. You understand that under these conditions I, in good faith, did not think I had to request prior authorization for reproduction, even if the latter was less onerous than the sum you have now fixed (according to the scale established in 1962 by the press union for periodicals with a circulation of less than 10,000, the photographic reproduction for less than a half page costs 20F). I can only approve your defense of artistic property, which is too often ignored. I would like to say that in this regard the photo published in Internationale Situationniste is reframed in such a way that it only reproduces the part of Monsieur Buffier’s postcard that concerns the document properly speaking ( the inscription itself), this by excluding those characteristics which confer on this post card the artistic imprint unique to Monsieur Buffier. That is, the framing he chose and also the title he gave this subject, the post cards in this series all having, in the lower left of the image, an integrated inscription which comments on its meaning (in this case, “Superfluous advice”). As for the third element, it is acknowledged that in measuring the artistic responsibility of a photograph – by which I mean the choice of a subject – it would appear that on this point I can claim creative property which equals, and probably eclipses, the merits of Monsieur Buffier artistic taste, limited in this case to a simple reproductive choice. To get to the heart of this question of artistic property, I would like to assure you that I in no way want to demand a portion of the receipts for the sale of this postcard or indemnities for its unauthorized reproduction here and there. But there is another aspect, in my eyes more important. The inscription in question was done in another period, and without any ambiguity it was presented by the avant-garde Situationist movement (cf. the title of this illustration on page 42 of our revue) as a serious sign of the artistic climate of an era, and as a moment in the development of the theories of this artistic movement, theories which have a pretension to a certain seriousness. But Monsieur Buffier, by his personal interpretation of this inscription, and which does not figure in issue 8 of the Internationale Situationniste, spreads it about in his humorous way. Monsieur Buffier’s title, in fact, is “Superfluous advice.” Given that it is well know that the great majority of people work, and that said work is, despite the strongest repulsion, imposed on the near totality of workers by a crushing constraint, the slogan NEVER WORK can in no way be considered “superfluous advice.” This term of Monsieur Buffier’s implies that such a position is already unquestioningly followed by all, and thus casts the most ironic discredit on my inscription, and consequently my ideas and those of the Situationist movement, whose French language revue I currently have the honor of editing. In the case then that this question can’t be settled amicably, as you say, it seems to me that, forced to prove that the original of this inscription should be attributed to me, I would be within my rights in demanding that you stop selling the postcards that present the fallaciously humorous interpretation, at least until he has printed on them a mention recognizing the serious intentions of the original author. As for an amicable settlement, which I prefer, it seems that its modalities in the first place depend on the position that Monsieur Buffier adopts when he becomes aware of this additional information concerning our reciprocal rights and obligations in this affair, which I request that you transmit to him.